Through the Lands of the Auteri and St Jarlath. The Archaeology of the M17 Galway to Tuam and N17 Tuam Bypass Schemes. NRA Scheme Monograph 17. Dublin. 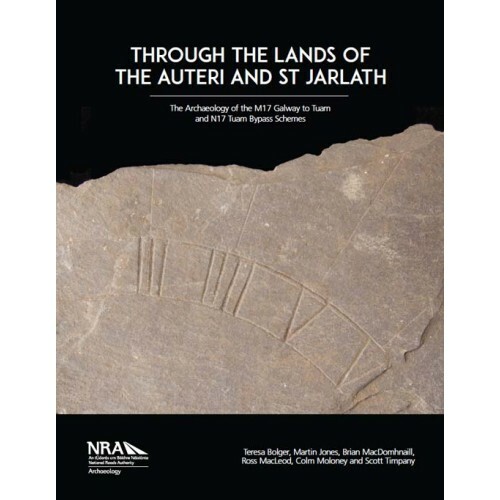 Through the Lands of the Auteri and St Jarlath describes archaeological investigations along the route of two national road projects; one running between Athenry?in the south?and Tuam in Co. Galway and the other bypassing the town of Tuam. The sites included in this book cover almost the entire span of human occupation of Ireland, from early prehistory to the Great Famine. This prehistoric activity is primarily centered on the relatively flat floodplains of the Clare, Abbert and Grange rivers near Tuam and is characterized by a mix of probable ritual and domestic sites; an Early Neolithic enclosure ditch in Kilskeagh townland dating to c. 3500 BC, a series of burnt mounds in Cloondarone townland which was probably used by an extended family group throughout the Bronze Age (other such sites were founds at Annagh Hill and Ardskea Beg) and a single Early to Middle Bronze Age cremation burial at Mahanagh. Early medieval activity is generally confined to the very northern and southern limits of the route; ringforts?enclosed farmsteads?were excavated to the immediate west of Athenry in Rathmorrissy townland and just north of Tuam in Kilcloghans townland. A number of skeletons were found during excavations at Rathmorrissy and a well-built, stone-lined souterrain (underground chamber) and a wealth of finds came from Kilcloghans. Clusters of collapsed Famine-period vernacular cottages—the practical dwellings of practical people?were excavated on Annagh Hill and at ‘Old Kilskeagh’. Several of these ruins are not represented on any map and the excavations here represent the only record of these buildings. The book is lavishly illustrated and the archaeological discoveries are presented in an easy, narrative style. Illustrations Maps, line drawings, photos; full colour.